Mayor London Breed at the groundbreaking ceremony on 490 South Van Ness on Wednesday evening. Photo by Abraham Rodriguez. A block party and a ceremonial blessing accompanied the groundbreaking celebration of the future affordable housing building at 490 South Van Ness Wednesday night. 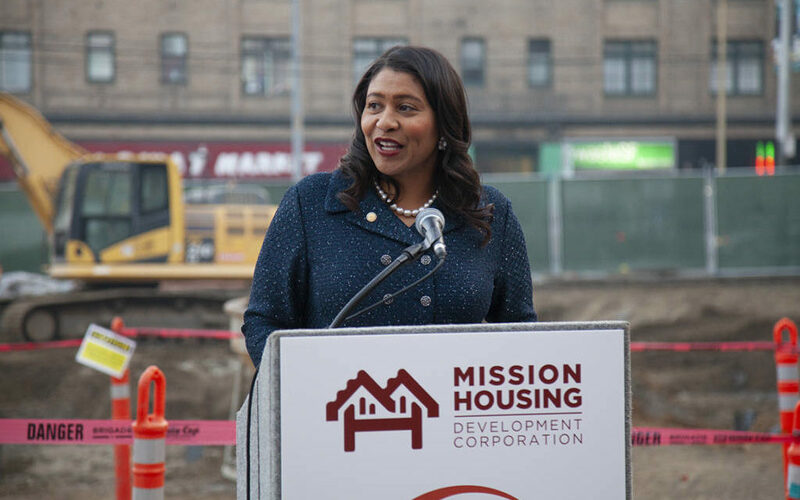 Led by San Francisco Mayor London Breed, city officials, developers and community leaders put shovels to dirt to break ground in the Mission’s second affordable housing project to get under way this year. The projects are the first fully affordable units to be built in the Mission in a decade. Located two blocks away from 16th Street BART, the building is a co-developing effort by Mission Housing Development Corporation and BRIDGE Housing. The 81 apartments will serve households with incomes up to 30 to 60 percent of the Area Median Income (AMI). Twenty units have been set aside for San Francisco families. “Projects like this one are the result of the city stepping up to create the affordable housing that we desperately need,” said Breed. She emphasized the challenges that remain including applications outreach inside District 9. Mission Housing’s last Mission development was Valencia Gardens, a 260-unit structure completed in 2006 that was a complete rebuilding of the older Valencia Gardens. Holding back tears, executive director Sam Moss highlighted former mayor Ed Lee’s decision to set aside $50 million in housing bonds to develop affordable housing in the Mission District. “It made us think bigger than just one project every so often,” he said. With next month’s kickoff of a 165-unit project at 1950 Mission Street, Moss is expecting the push for affordable housing to get even stronger during the coming years. Aptly titled “Los Sueños del Pueblo” (“The Dreams of the People”), the celebration started off with a ceremonial blessing by Estela Garcia, executive director of the Instituto Familiar de la Raza. In a prayer full of incense, she stressed how the project was fulfilling the purpose of the land. Raising their arms to all four cardinal points, approximately 80 attendees accompanied the commemoration. Nothing is ‘”affordable” about $900,000 dollars per unit. But it is a lovely subsidized give away, for a lucky few lottery winners. Where do we buy a ticket? Where do I buy a ticket?an how much is the ticket?